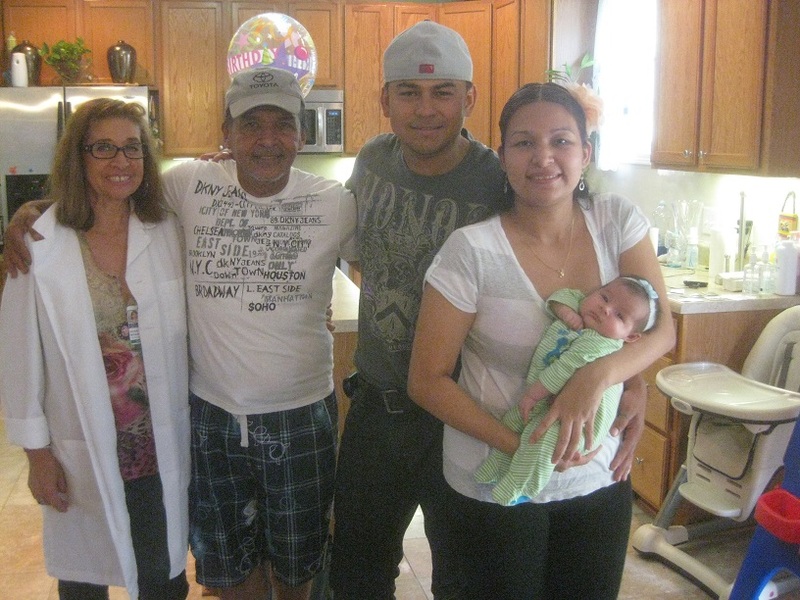 Liz Lorduy had a Durham Connects visit after the birth of her first child and knew how helpful it was to have a Spanish speaking nurse support her in her home. Liz and her husband are bilingual but she appreciated the comfort of speaking in her native language. After her second child was born at a low birthweight, Liz was very concerned about her growth and development. The Durham Connects nurse was able to provide an extra weight check and hands on breastfeeding support to assure her that her baby was growing well. The nurse was also able to ensure the family’s access to primary healthcare and other support. Liz saw the benefit of visiting with a Durham Connects nurse after the birth of both her children because every baby is different and the whole family benefits. In this photo, Durham Connects Rosalia Monaco is standing with Liz Lorduy (and baby Lizbeth) and her husband and father-in-law.